Physicist Heinrich Wilhelm Dove first discovered binaural, auditory beat simulation in 1839. And found that when two generated tones, signals of different frequencies were presented separately one to each of your ears; your brain detects the phase variation between them and attempts to reconcile the difference. As these two frequencies move in and out of phase your brain creates a third signal called a binaural beat, equal to the difference between the two frequencies. When your brain begins to resonate to the binaural beat, or “follows” the beat you'll experience the Frequency Following Response, where your brain is triggered to resonate at that frequency, a phenomenon that was researched and tested in 1973 by biophysicist Gerald Oster at Mount Sinai Hospital in New York City. Oster’s research and others on binaural beats and the Frequency Following Response has paved the way for further development in the area of auditory stimulation to enhance brain functioning. Neuroscientists recently discovered a correlation between an increase of alpha brain waves, either through electrical stimulation or meditation that has the ability to reduce depressive symptoms and to increase creativity. Your brain will typically produce one of five small rhythmic electrical pulses, patterns that can be observed using an electroencephalograph (EEG) scanning equipment. Gamma waves are associated with higher mental functioning, perception, problem solving, self-awareness, compassion and emotional responses such as happiness and fear. Beta waves are most present when we are consciously awake and during periods of concentration, activity, anxiety and arousal. 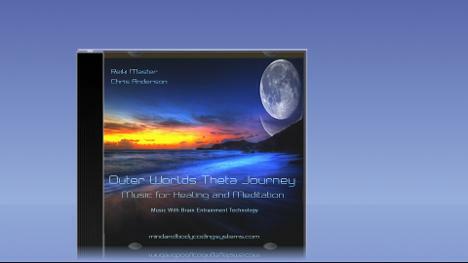 Alpha waves are linked to creativity and the state of relaxation and mindfulness. Theta waves are associated with the right brain as well as subconscious thinking, deep relaxation, mental imagery and meditation. Delta waves occur during periods of deep dreamless sleep and are linked to healing, recovery and pain relief. For brain entrainment recordings to be able to work effectively where your brain can create a binaural beat and to experience the frequency following response, the wearing of stereo headphones is essential. Listening to some binaural frequencies can cause you to feel deeply relaxed, drowsy or disorientated. For these reasons alone you are advised never to listen to any binaural frequencies in recordings whilst driving or operating machinery. Disclaimer: If you are pregnant, suffer from or prone to having seizures, have any psychological condition and uncertain if Brain Entrainment is suitable for you, please consult your medical practitioner.